Divides input A by input B and outputs the fractional part only. 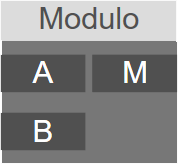 The node divides the value of input A by the value of input B and outputs the fractional part of the result on the M output. M: Result of the operation: A % B.